The 2016 Toyota Tacoma has been promised as an "all-new" mid-sized truck to finally replace the current rendition we've lived with for almost a decade. From the one photo the company has released so far, the new Taco sure looks like its big stablemate the Tundra to me. The redesigned Tacoma is slated to do January 12, 2015 at the Detroit Auto Show so I guess I'll withhold judgements until then. But the primary design elements; chunkiness, stamped tailgate, definitely bear family resemblance. Not that there's anything wrong with sharing a look across the line, and the Tundra's tailgate is one of the more interesting ones out there right now anyway. Keep your eyes open for other similarities as subsequent pictures of the new truck come out. "The all-new 2016 Tacoma will be ready to once again set the benchmark for midsize pickup performance. 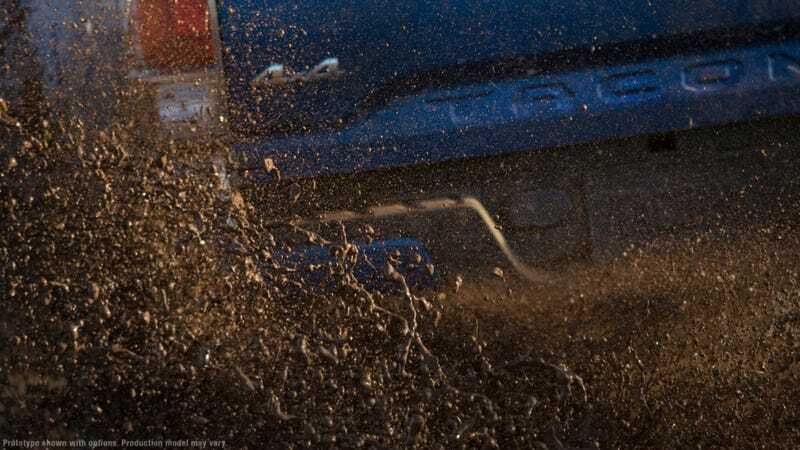 Backed by a heritage of unwavering capability, an unbreakable attitude and new, rugged tech, Tacoma's off-road prowess is more formidable than ever. This is how we make America's best-selling* pickup in its segment for the last ten years better in every way."